KT Corp. said on Monday it has signed an agreement with Kakao Mobility to cooperate in smart mobility business that will allow subscribers to use various Kakao T services behind the wheels. 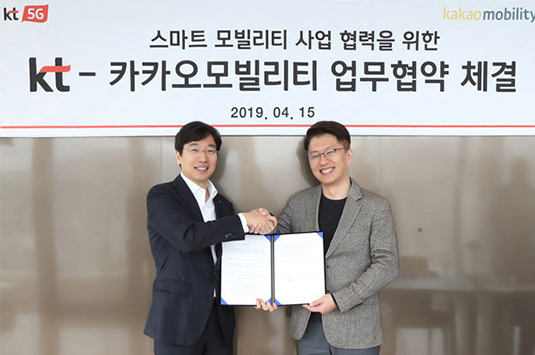 The two aim to provide new services by combining KT’s connected car platform GiGA Drive and Kakao Mobility’s Kakao T platform. The two are envisioning their business as a Mobility as a Service (MaaS) model that integrates finished car, connected car platform and business to consumer services into one. The basic concept is the combination of commercial vehicles equipped with KT’s connected platform, the company’s B2B capacity and Kakao T services. Under the agreement, they will develop an in-vehicle infotainment device to use Kakao T services inside a car and the connection between the car navigation and Kakao T.
KT now provides its connected car platform to 14 finished car manufacturers including Hyundai Motor and Mercedes Benz. KT said its connected car platform accounts for about 46 percent in the Korean connected car market that is estimated to involve about 1.86 million units. Kakao Mobility runs Kakao T, the largest mobility platform in Korea with 22 million subscribers, to provide taxi, driver-for-hire, electric bicycle and navigation services. The two are also considering ways to link KT’s 5G-based self-driving and car control technology and Kakao Mobility’s Kakao T services. “We expect Kakao T, the mobility service with the largest number of B2C subscribers in Korea, will meet various needs of subscribers to KT Connected Car Platform. The two companies will continue to work together to revitalize the smart mobility industry,” said Choi Gang-lim, head of KT’s Connected Car Business Center.